Static timing analysis of a design is performed to estimate its working frequency after the design has been fabricated. Nominal delays of the logic gates as per characterization are calculated and some pessimism is applied above that to see if there will be any setup and/or hold violation at the target frequency. However, all the transistors manufactured are not alike. Also, not all the transistors receive the same voltage and are at same temperature. The characterized delay is just the delay of which there is maximum probability. 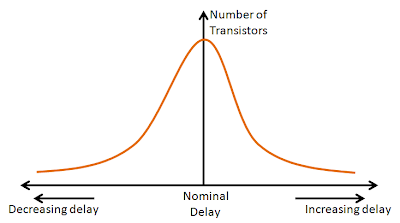 The delay variation of a typical sample of transistors on silicon follows the curve as shown in figure 1. As is shown, most of the transistors have nominal characteristics. Typically, timing signoff is carried out with some margin. By doing this, the designer is trying to ensure that more number of transistors are covered. There is direct relationship between the margin and yield. Greater the margin taken, larger is the yield. However, after a certain point, there is not much increase in yield by increasing margins. In that case, it adds more cost to the designer than it saves by increase in yield. Therefore, margins should be applied so as to give maximum profits. Process variations: The process of fabrication includes diffusion, drawing out of metal wires, gate drawing etc. The diffusion density is not uniform throughout wafer. Also, the width of metal wire is not constant. Let us say, the width is 1um +- 20 nm. So, the metal delays are bound to be within a range rather than a single value. Similarly, diffusion regions for all transistors will not have exactly same diffusion concentrations. So, all transistors are expected to have somewhat different characteristics. Voltage variation: Power is distributed to all transistors on the chip with the help of a power grid. The power grid has its own resistance and capacitance. So, there is voltage drop along the power grid. Those transistors situated close to power source (or those having lesser resistive paths from power source) receive larger voltage as compared to other transistors. 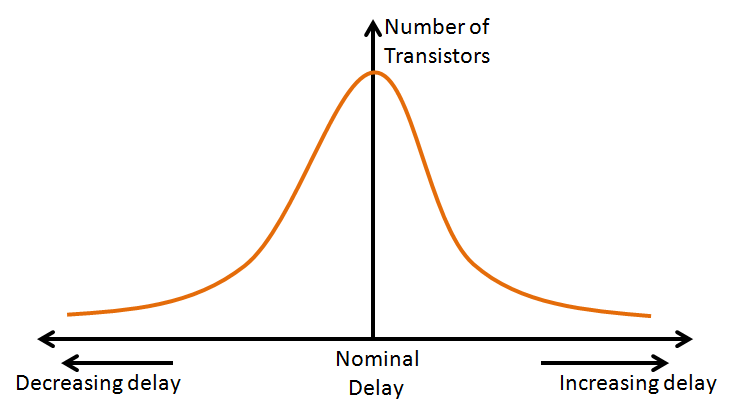 That is why, there is variation seen across transistors for delay. Temperature variation: Similarly, all the transistors on the same chip cannot have same temperature. So, there are variations in characteristics due to variation in temperatures across the chip. How to take care of OCV: To tackle OCV, the STA for the design is closed with some margins. There are various margining methodologies available. One of these is applying a flat margin over whole design. However, this is over pessimistic since some cells may be more prone to variations than others. Another approach is applying cell based margins based on silicon data as what cells are more prone to variations. There also exist methodologies based on different theories e.g. location based margins and statistically calculated margins. As advances are happening in STA, more accurate and faster discoveries are coming into existence.